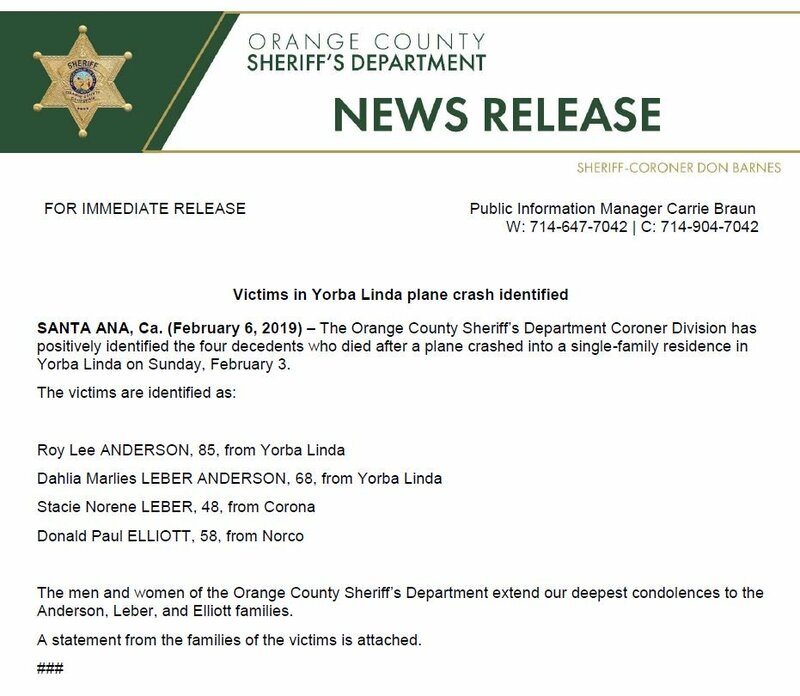 On February 3, 2019, at 1345 Pacific standard time, a Cessna 414, N414RS, experienced an in-flight breakup over Yorba Linda, California, about 11 miles west of the departure airport Fullerton Municipal Airport (FUL), Fullerton, California. 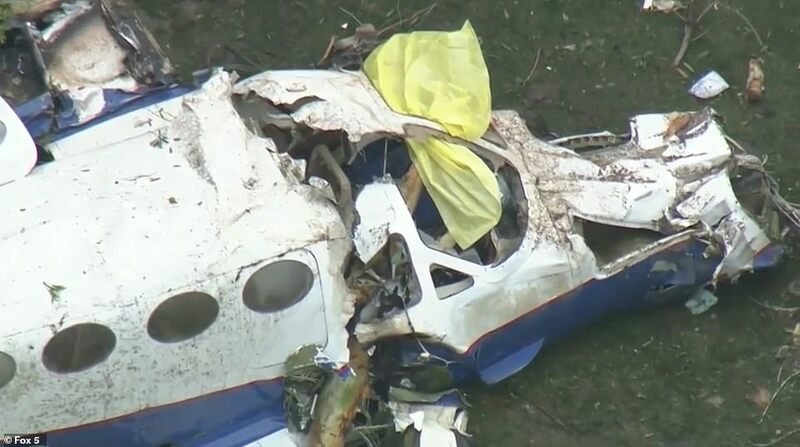 The pilot and four individuals on the ground sustained fatal injuries, two individuals on the ground sustained serious injuries and the airplane was destroyed. 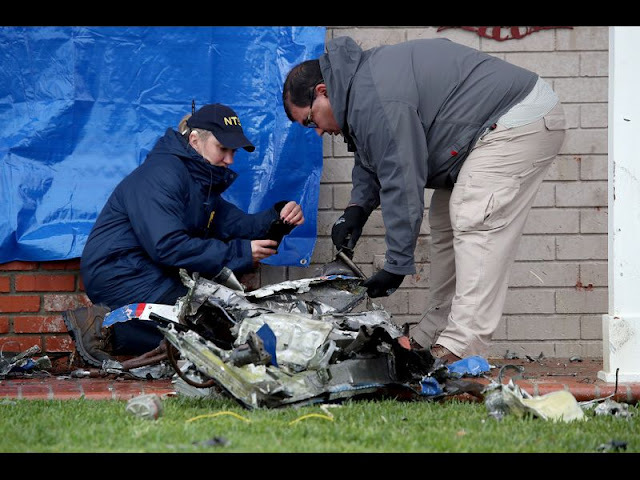 The airplane was registered to and operated by the private pilot as a 14 Code of Federal Regulations (CFR) Part 91 cross-country personal flight. Visual meteorological conditions (VMC) prevailed over the accident location, and no flight plan was filed. The flight departed at 1339, with a planned destination of Minden-Tahoe Airport (MEV), Minden, Nevada. 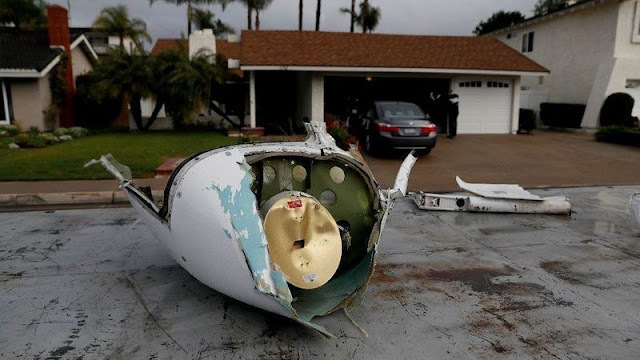 Radar and audio communications data provided by the Federal Aviation Administration (FAA) revealed that after departing FUL, the pilot initiated a climbing left turn to the east. Visual meteorological conditions (VMC) existed at the departure airport, however, preliminary information indicated that the weather transitioned to instrument meteorological conditions (IMC) with precipitation, microburst and rain showers over the accident area. During the take-off clearance, the FUL tower air traffic controller cautioned the pilot regarding deteriorating weather, about 4 miles east of FUL. Radar data showed that 5 1/2 minutes after takeoff, the airplane had climbed to an altitude of about 7,800 ft above ground level before it started a rapid descending right turn and subsequently impacted the ground. Numerous witnesses who were located near the accident site, saw the airplane exit the clouds at a high rate of descent before parts of the airplane started to break off. One witness reported that he, "observed an aircraft emerge from the overcast layer on a northwesterly heading with a nose down pitch of approximately 60 degrees, pointed directly at my location with no discernable movement. It remained in that attitude for approximately 4 to 5 seconds before initiating a high-speed dive recovery. Approaching the bottom of the recovery the aircraft began to roll to its right. As it did, the left horizontal stabilizer departed the aircraft, immediately followed by the remainder of the empennage. The left wing then appeared to shear off just outside of the number one (left) engine igniting the left wing. After which, the aircraft disappeared behind the hill to the northeast of the observed location, trailing flames behind it. The sound of an explosion and large plume of black smoke immediately followed." Examination of the accident site revealed that the wreckage debris was scattered throughout a neighborhood area about 1,000 ft long and 800 ft wide on a south-to-north orientation. At the far south parameter of the debris field were tail sections. The far north area contained the left engine, and left propeller and the fuselage. About 700 ft north-east from the first recovered piece of debris, the right engine and the right propeller impacted an asphalt road, and came to rest in a nearby front yard. The left wing was found about 716 ft north of the first recovered piece of debris, about 140 ft south-west of a burned house. Within the house, fragments of the outboard right wing (which also contained the fuel tank) were located. The fuselage with the attached right inboard wing, along with the left propeller and left engine were located about 310 ft downhill from the burned house on a heading of 310°. The wreckage was recovered and moved to a secure location for future examination. 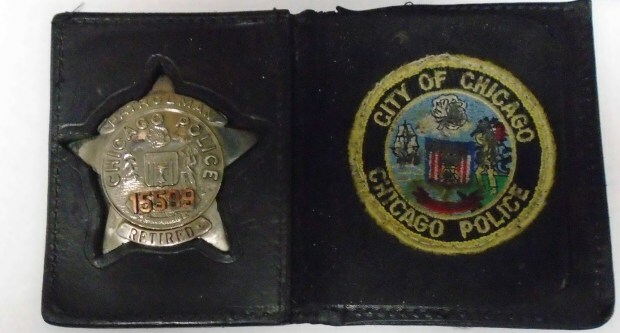 Pastini was carrying this Chicago police badge when he crashed Sunday. They were one and the same person. 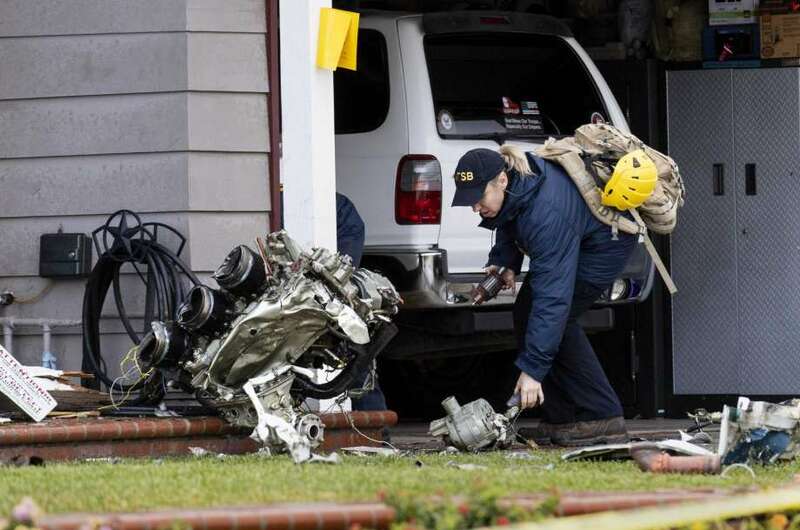 But he might have lived out his days simply as Tony Pastini, the garrulous retired cop, had his twin-engine Cessna not plummeted 7,800 feet on Feb. 3 into an Orange County, Calif., suburb, killing him and four people who were on the ground. From the smoldering wreckage, investigators plucked a police badge belonging to Retired Chicago Patrolman No. 15599. That discovery would help unravel the threads of a life story Pastini spent three decades crafting. The 75-year-old, it turned out, had never been a Chicago cop, though it appeared he wished he had been. It could take 18 months — or more — for federal investigators to probe the cause of the fatal crash. 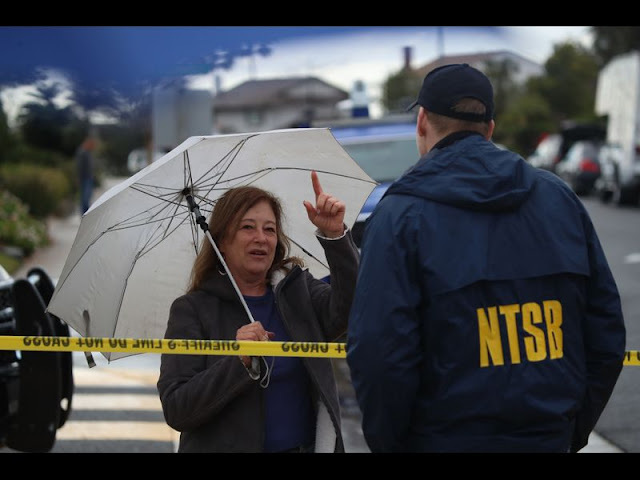 They will likely scrutinize the pilot’s medical condition and examine the three-day period preceding the crash, looking for fatigue and other “high-stress events,” said Peter Knudson, a National Transportation Safety Board spokesman. Only in rare circumstances, such as when suicide is suspected, will the NTSB dig into a pilot’s backstory, said Barry Schiff, a longtime pilot and aviation safety consultant. In a report, the NTSB said that, on the afternoon of Feb. 3, an air traffic controller warned Pastini on takeoff from Fullerton Municipal Airport that he was headed into bad weather. If he ignored the warning, it was not the first time he had bucked conventions in the air. On a January morning in 1977, Pastini was flying from Las Vegas to Long Beach when the weather turned icy. Clouds and fog made it difficult to fly by sight alone. Rather than turning back or changing his route, he falsely told air traffic control he was instrument-rated and finished the flight. A judge called his indifference to airspace rules “a potential threat to himself, his passenger and other users of the system” and suspended his license for 120 days. Three years later, his plane was found behind on inspections, carrying an expired temporary registration and leaking fluid from a brake. He lost his license for 30 days. For years, Pastini’s restaurants were favored by cops. He enjoyed being known as one of them, both for the camaraderie it inspired with Nevada police and the boost it delivered to his businesses, said Marc Picker, his former attorney. He gave discounts to police officers who brought their families to eat. He held fundraisers for cops who’d been mailed letter bombs, shot by stickup men and killed in training accidents. A wall of his Reno deli was covered in police patches. After he died and federal investigators identified him as a former Chicago cop, the Chicago Police Department, the police union and an association of retired officers declared that no one named Antonio Pastini was ever a city police officer. That applied to two other names Pastini also had used, they said. The badge he was carrying when he died had been reported missing in 1978. Pastini’s nephew, Gary Willis, insisted that his uncle “truly was a police officer” and that he had had “perfectly legitimate reasons” to change his name. He would not say what those reasons were, beyond suggesting his uncle wanted to start life anew after leaving police work. But when Pastini opened a string of delis in Nevada in the early 1990s, he openly touted a law enforcement background. He told the Reno Gazette-Journal he had retired in 1986 at the rank of “detective sergeant” after a 17-year career with the Chicago police. He told reporters he was a Marine who had been stationed in Japan — a claim the Marines dispute. As a businessman, Pastini sued a columnist for saying the beef hot dogs he sold were made of pork. He wrote fuming letters to newspapers that dared to publish failed health inspections of his delis. In the early 1990s, Pastini met Dennis Hof, a businessman who owned legal brothels in Nevada. This was years before Hof found celebrity on an HBO show about his bordellos and before his campaign for a state Assembly seat, which he won last year posthumously. On occasion, Pastini flew women who worked at the Moonlite Bunny Ranch, Hof’s brothel near Carson City, as well as the Bunny Ranch’s maintenance man, said Zack Hames, Hof’s executive assistant. Antonio Peter Pastini was born Jordan Albert Isaacson in the mid-1940s. Born in Illinois, he was drawn to California in his early 20s by “the itch for exploration,” said Willis, his nephew. At 22, he suffered a motorcycle accident so bizarre it was reported by the Signal newspaper in Santa Clarita. He staggered onto the porch of an elderly woman, clutching his chest and “gushing” blood. “He spurted out a tale that he had been riding his motorcycle with friends when someone threw a beer can at him,” the newspaper reported. By the 1970s, he was running gas stations, tow trucks and a stereo company. He was also piloting small planes. Richard Yorty, his partner in the stereo company, recalled taking weekday jaunts to Las Vegas. “We used to take off about noon, fly out to Vegas and come back round 5 or 6,” said Yorty, now 64. Civil petitions for name changes that Pastini filed in Arizona and California courts offer little explanation for why he changed names. When he legally became Jordan “Ike” Aaron in 1981, he told an Arizona court that he already went by the name in California. The following year, he ran for justice of the peace in Bullhead City using that name, the Arizona Republic reported at the time. When he changed it to Antonio Peter Pastini in 2008, he wrote in a petition that he was already using the name professionally. During a 2001 divorce, Pastini’s fourth wife alleged that he had driver’s licenses and bank accounts under multiple names. In a court filing, his ex-wife included a W-2 form from Pastini’s sushi restaurant that showed both Jordan Aaron and Antonio Pastini drawing a wage in 2000 with different Social Security numbers. Jordan Aaron was listed in incorporation records as president, Antonio Pastini as CEO. Pastini could not get a liquor license in his name because he “had some trouble with the law,” the ex-wife’s attorney said in another filing. A criminal assessment, done when he changed his name in 2008, showed he was arrested but not charged in 1989 for “cheating” in Nevada. The Los Angeles Times requested records of enforcement actions taken against Antonio Pastini, Jordan Aaron and Jordan Isaacson from the Nevada Gaming Control Board, which regulates gambling in the state. The board said it had records for the three names but that they were confidential under Nevada law. 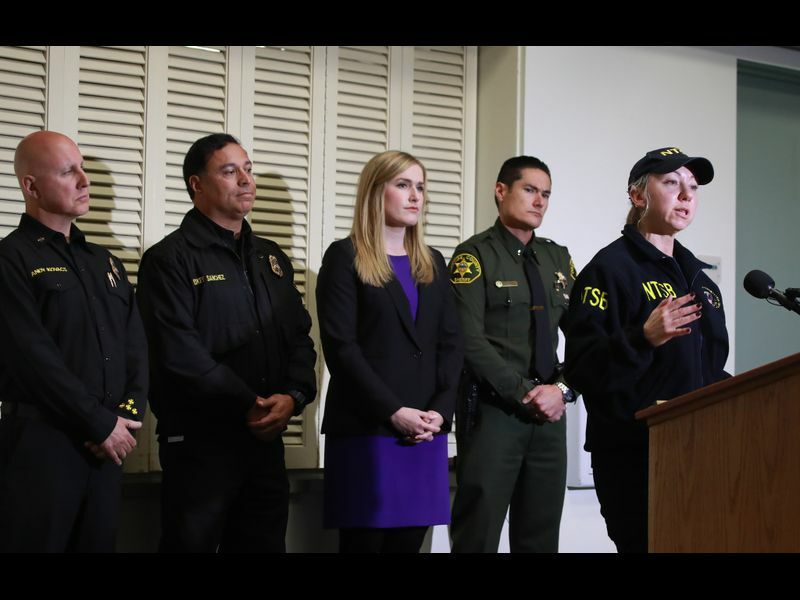 The only person who knows the whole story, it seems, climbed into his Cessna 414A at Fullerton Municipal Airport the afternoon of Feb. 3, bound for Minden-Tahoe Airport in Nevada. Five minutes later, Pastini’s plane burst through the clouds over Yorba Linda, barreling nose-first toward the ground, according to witnesses. Its tail and left wing were shorn off as the pilot tried to pull the plane out of the dive. A wing that held a fuel tank struck a home where six people had gathered to watch the Super Bowl. Two escaped with serious burns. The other four were killed: Roy Lee Anderson and Dahlia Marlies Leber Anderson, a couple who brought an elderly neighbor his paper every morning and helped with upkeep; and Stacie Norene Leber and Donald Paul Elliott, relatives of the Andersons who were visiting that Sunday afternoon. 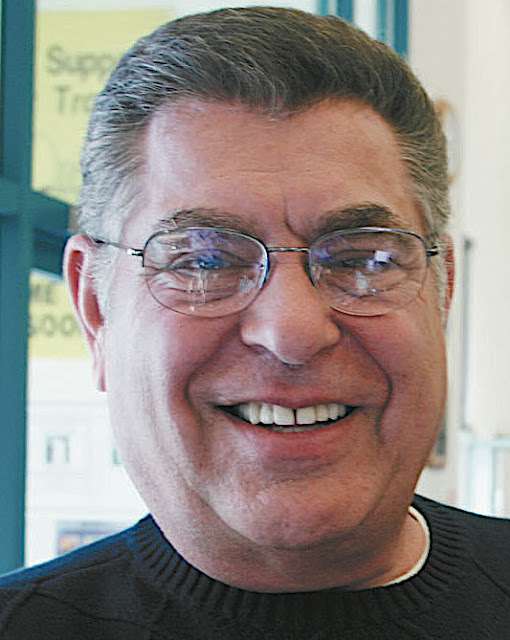 Friends and acquaintances of Tony Pastini described him as a generous member of the community, a long-time supporter of local youth programs. He was a friendly face to his neighbors. To his daughter, Julia Ackley, he was a hero. 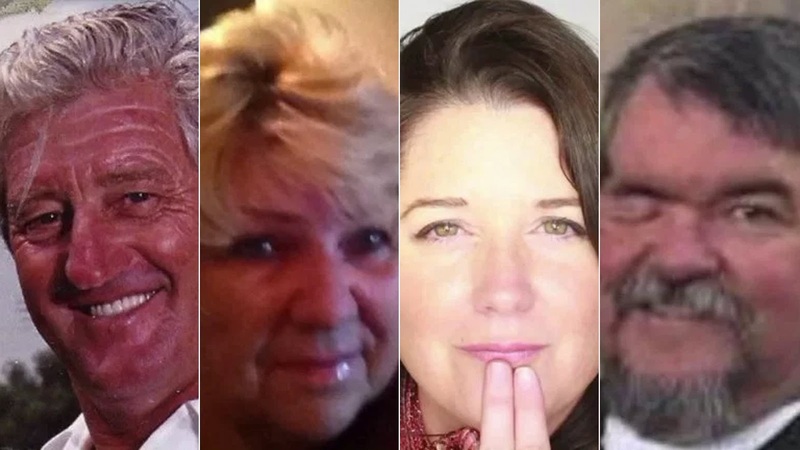 In the wake of Pastini's death, however, information about the 75 year-old Gardnerville resident and Carson City restaurateur has surfaced, raising more questions from the Feb. 3 plane crash in Yorba Linda, CA, that killed five people, including Pastini. Pastini died last Sunday when the twin-engine Cessna Chancellor he was piloting appeared to have broken apart in the air, causing the aircraft to plummet and crash into a residence, killing Pastini and four people inside of the home. The first question that arose in the days following the deadly crash was the legitimacy of law enforcement credentials recovered from the wreckage. Pastini had openly and often talked about his law enforcement career as a Chicago police officer. But Los Angeles broadcast affiliates reported Feb. 5 that the credentials found were determined by authorities to be fake. Even the number on the badge recovered from Pastini's body had been reported lost or stolen in 1978. The Chicago Police Department, where Pastini was said to have retired from, had no record of him ever serving on the force. The credentials he was carrying at the time of the crash appeared to be "fictitiously created," a Chicago Police spokesman told NBC News. Neither Pastini's known name nor his given name could show that he had served in law enforcement despite those credentials identifying him. He was born Jordan Isaacson, Ackley told NBC Los Angeles, and he was often referred to by his nickname, "Ike." He reportedly changed his name in the 1970s for unknown reasons. In a 1997 interview with the Reno Gazette-Journal, Pastini described himself as having been "on both sides of the law, as criminal and cop." He elaborated to the RGJ reporter at the time that he had once been arrested on suspicion of grand theft at the age of 14. In Northern Nevada, Pastini was the well-known owner of Kim Lee's Sushi and Teriyaki restaurant in downtown Carson City. His passion for the food industry led him to train fellow restaurant owners on food and health safety topics as well. He was well-liked among his colleagues and other community members in Carson City and the Carson Valley. Outside of the restaurant scene, Pastini was also an experienced pilot, who held multiple Federal Aviation Administration (FAA) certifications to fly single and twin-engine aircraft as well as helicopters, according to a report published Thursday by the Herald and News in Klamath Falls, OR, near where the crashed aircraft had been registered. The Southern Oregon newspaper reported that Pastini's twin-engine Cessna Chancellor had been registered in the community of Chiloquin in Klamath County, OR, for reasons not yet known. Registration filings list a company titled "KL Management LLC" assuming ownership of the aircraft in 2017, the Herald and News reported. The address posted on the registration for KL Management turned out to be the location of a quilting shop in Klamath Falls, where a Debbie Pastini has operated a retail business. A sign was recently placed on the front door of the business, stating the store was closed temporarily because of a family emergency, the Herald and News reported. Debbie Pastini could not be reached for comment, the paper said, and her relation to Tony Pastini is unclear at this time. The Oregon Secretary of State’s Office told the Herald and News that no record of KL Management LLC existed with the state; although filings for it may still be pending. Records with the Nevada Secretary of State's Office show Pastini's name linked to several registered business entities, including Barritone, Inc., Food Safety Network, Inc., Debbie-Lynn's Creamery, Inc., MTL Management, Inc. and Veranda View LLC. The name Deborah or Debbie Pastini also appears in the state business license registry under Debbie-Lynn's Creamery, MTL Management, Kim Lee's Restaurants, Inc. and KL Management, LLC. Of those registered licenses, only KL Management and Veranda View are currently active. The others have been revoked, according to nvsilverflume.gov, the Nevada Secretary of State's business portal. 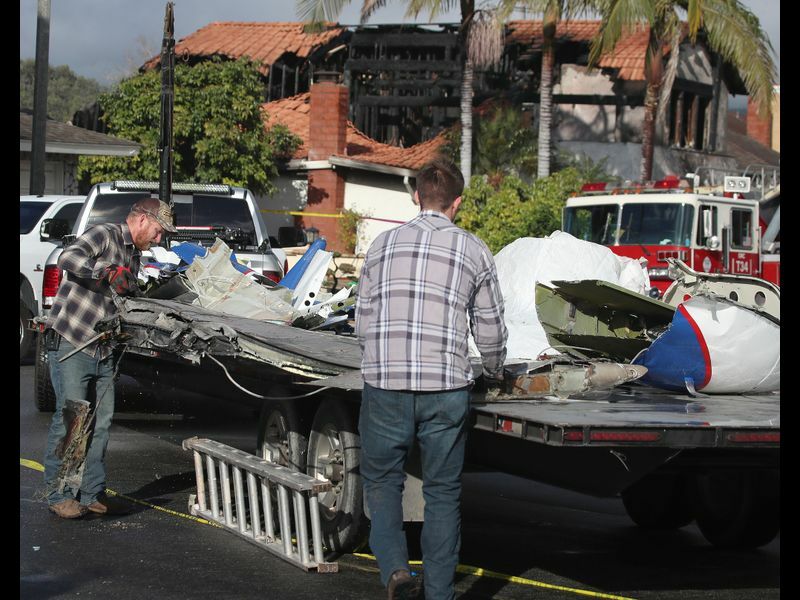 Pastini was said to have flown often to visit his daughter in Orange County, CA, where his plane had taken off from just minutes before it broke apart and crashed. He was said to have been a good friend of the late brothel owner-turned-state assembly candidate Dennis Hof, who called Pastini "his pilot" at the legal pimp's 72nd birthday bash last October, shortly after which he was found dead in a Southern Nevada brothel. Pastini regularly flew Hof and his girls at no charge as long as they paid for the fuel costs, according to reports. He started flying this past November for Angel Flight West, a volunteer organization that arranges flights to and from health care facilities for people who otherwise wouldn’t be able to make the trip. 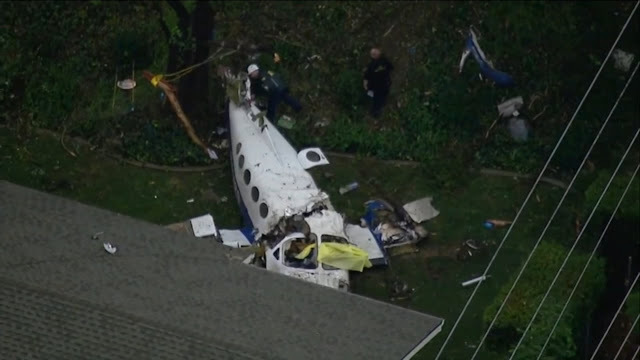 The investigation into last Sunday's deadly plane crash is ongoing. 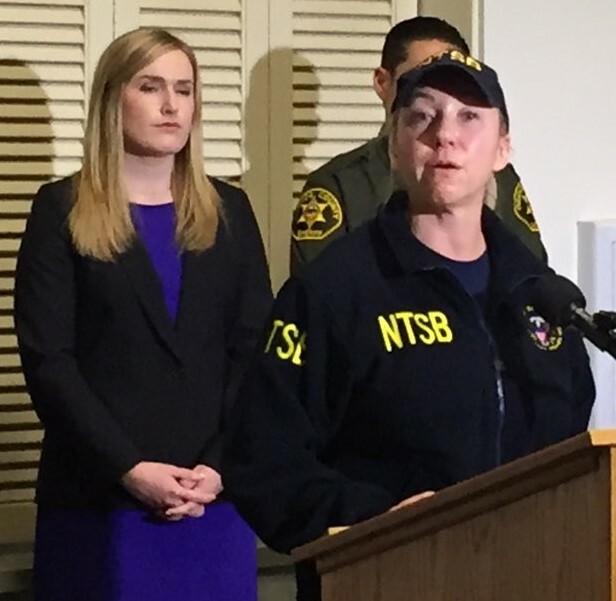 The National Transportation Safety Board (NTSB) has moved the wreckage to storage unit in Phoenix, AZ, where investigators will continue to piece together the cause of the crash. Pastini leaves behind four grandchildren and seven great-grandchildren. 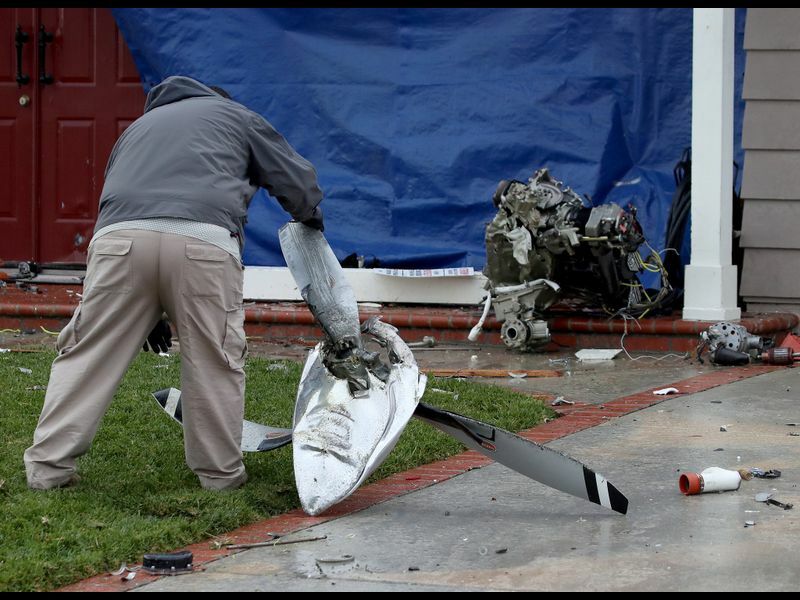 As the clean-up efforts continue in a residential neighborhood in the Los Angeles suburb of Yorba Linda, following a deadly airplane crash on Sunday, unanswered questions remain over the pilot and aircraft, both with apparent local ties to Klamath County. A Cessna 414A Chancellor twin-engine aircraft built in 1981, designated as N414RS by the Federal Aviation Administration (FAA), took off from the Fullerton Municipal Airport around 1:35 p.m. on Sunday bound for Minden, Nev. 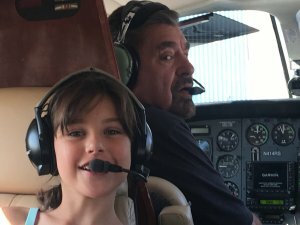 The pilot was 75-year old Antonio Pastini, a Nevada resident and experienced pilot who had been visiting his daughter, Julia Ackley, in Orange County. 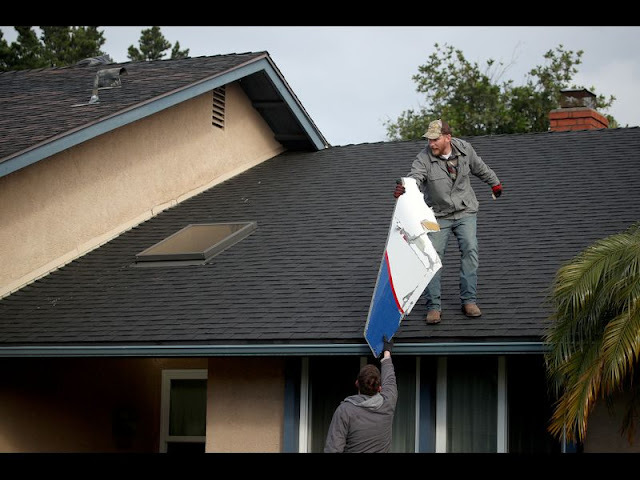 The aircraft broke up in mid-air 10 minutes after takeoff, spilling fuel and aircraft parts across a neighborhood that resulted in one home being incinerated with four victims inside, as well as the death of the pilot. In the wake of the accident, several oddities have emerged, as well as local ties for both the pilot and aircraft to Klamath County. 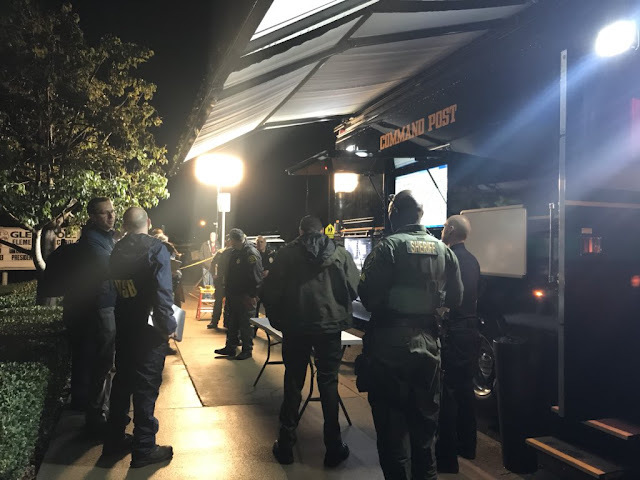 Pastini, who reportedly was born Jordan Isaacson, and went by the nickname “Ike,” was a restaurant owner in the Carson City, Nev., area. He claimed to have been a Chicago police officer for 21 years before retiring and moving west to enter the restaurant industry, and in the initial press conference following the crash the Orange County Sheriff’s Department announced Pastini was a retired Chicago officer based on a badge and paperwork found in the cockpit of the aircraft. On Monday, Officer Michelle Tannehill, spokesperson for Chicago Police Department, announced that no records were found indicating Antonio Pastini or Jordan Isaacson was ever affiliated with the department. The badge number Pastini had in his possession had been reported lost in 1978. While Pastini served in the military, it is unclear at this time if he ever was a police officer, despite representing himself as one repeatedly on social media and through interviews about his restaurants. An article published by the Nevada Appeal in 2008 stated that Pastini had joined the Chicago PD as a patrolman and served 21 years, and moved to northern Nevada after retirement to begin opening restaurants. Pastini also served as a food safety instructor, according to the Nevada state website. Pastini boasted that his restaurants became “the cop hangout” around Carson City. An experienced pilot, Pastini held FAA certification ratings for single-engine, multi-engine and rotorcraft aircraft. FAA registration history indicates that the aircraft was purchased by Pastini on Dec. 21, 2017 from Air 20 Corp., which had registered the airplane in Gardnerville, Nev. since 2014, where Pastini resided. However, Pastini, for reasons yet to be verified by the FAA, registered the aircraft in Chiloquin. Previous registration indicates the aircraft was owned by Carman Law Office PC in Billings, Mont., prior to Air 20 Corp., and had been based in Las Vegas, Nev. from 2006-2009 with Silver State Helicopters LLC. The Oregon State Airports Manager in Salem, Matthew Maass, indicated that as an uncontrolled airport there is no on-site airport manager for Chiloquin who could verify whether the aircraft had indeed been stored in Klamath County per its 2017 registration. At the time of the crash new registration of the aircraft was pending, filed on Oct. 31, 2018, and listed as pending per FAA approval as of Jan. 2. Registration filings list a company titled KL Management LLC assuming ownership of the aircraft. The address posted for KL Management is 5718 S. 6th St. in Klamath Falls, site of the Cagey Quilter, owned and operated by Debbie Pastini since 2014. The Oregon Secretary of State’s Office shows no record of KL Management LLC existing, however proper business filings for it may still be pending with state offices. It is common for aircraft to be stored out-of-state, or listed as an out-of-state registry, for tax purposes. An aircraft needs only to be stored in Oregon for 30 days before being eligible for FAA registration, thereafter Pastini could have kept his airplane in Nevada while maintaining Oregon registration. When an aircraft is sold a temporary aircraft registration is issued, good for 120 days; however these often extend beyond that timeline, particular in the wake of a government shutdown. Ackley was interviewed on Tuesday by television station KABC regarding her father, but declined to respond to questions about Pastini’s claim to be a retired police officer. It also remains unclear why Jordan Isaacson claimed the name Atonio Pastini. She did, however, indicate that Pastini was an experienced pilot, and that she had flown in the aircraft many times with him. Chicago Police Department announced that they were not investigating possible fraud charges against Pastini for posing as a law enforcement officer, since he died in the aircraft accident on Sunday. The National Transportation Safety Board (NTSB) has yet to issue a public report on Sunday’s accident. In an interview with the Associated Press, NTSB Safety Board Investigator Maja Smith stated that witnesses described the aircraft coming out of a cloud and its tail and other parts breaking off as it rapidly descended. Several videos taken from the ground of the aircraft in its final moments confirm this, with large bursts of flame and debris visible as the aircraft rapidly descended. Further video evidence of debris on the ground provides insight into what may have caused the Cessna 414A to break apart. “The videos emerging suggest that one of the engines of the aircraft came apart in flight, created an imbalance and the vibrations were so severe that it ripped itself from the motor mounts and compromised the wing,” said Robert Katz, a veteran commercial pilot and flight instructor for 38 years. A vigil in memory of the four family members killed on the ground when a plane crashed through a Yorba Linda home Sunday will be held at a nearby elementary school Thursday night. Roy Lee Anderson, 85, and 68-year-old Dahlia Marlies Leber Anderson were at home getting ready to watch the Super Bowl with Stacie Norene Leber, 48, and Donald Paul Elliott, 58, when the aircraft came down, killing all four and engulfing the home in flames. The pilot, identified as 75-year-old Antonio Pastini, was also killed in the crash and two other people were injured on the ground. 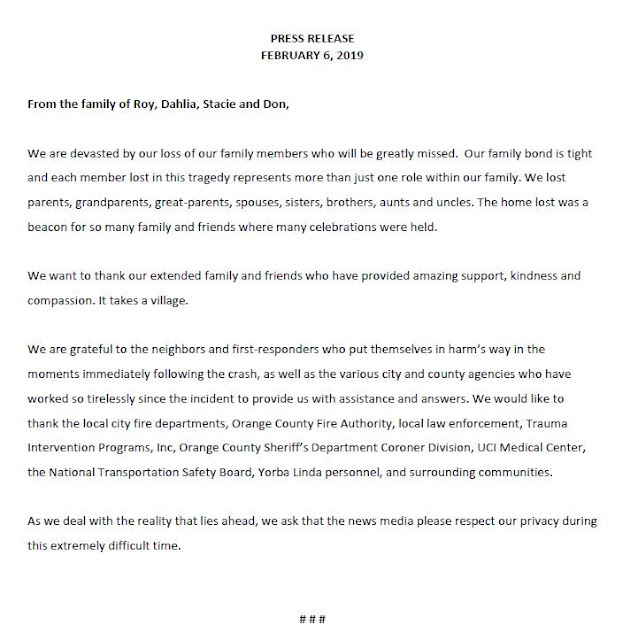 The vigil for the four family members is scheduled to take place at 7:30 p.m. at Glenknoll Elementary School, located at 6361 Glenknoll Drive in Yorba Linda. Relatives released a statement Wednesday. 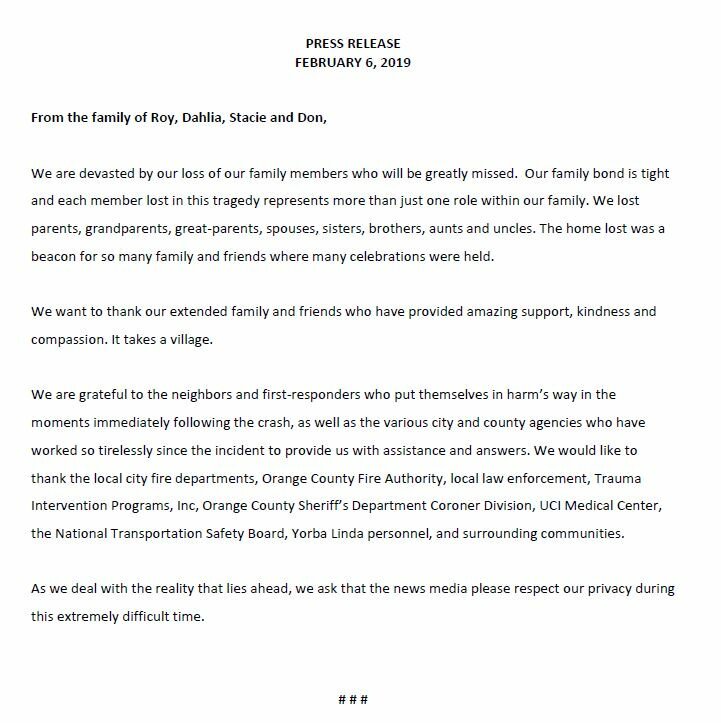 "Our family bond is tight and each member lost in this tragedy represents more than just one role within our family," the statement read in part. "We lost parents, grandparents, great-parents, spouses, sisters, brothers, aunts and uncles. The home lost was a beacon for so many family and friends where many celebrations were held." The statement described the family as “devastated” and concluded by asking for privacy. Pastini, the sole occupant of the plane, was originally identified by authorities as a retired Chicago police officer. Investigators later received a call from Chicago police telling them the credentials appeared to be fake and they had no record of Pastini working for them, The Orange County Register reported. They also told investigators a badge with the same number had been reported lost in 1978. Investigators believe Pastini’s Cessna 414A Chancellor began to break up in the sky shortly after taking off from Fullerton airport. National Transportation Safety Board and Federal Aviation Administration officials are investigating the crash. 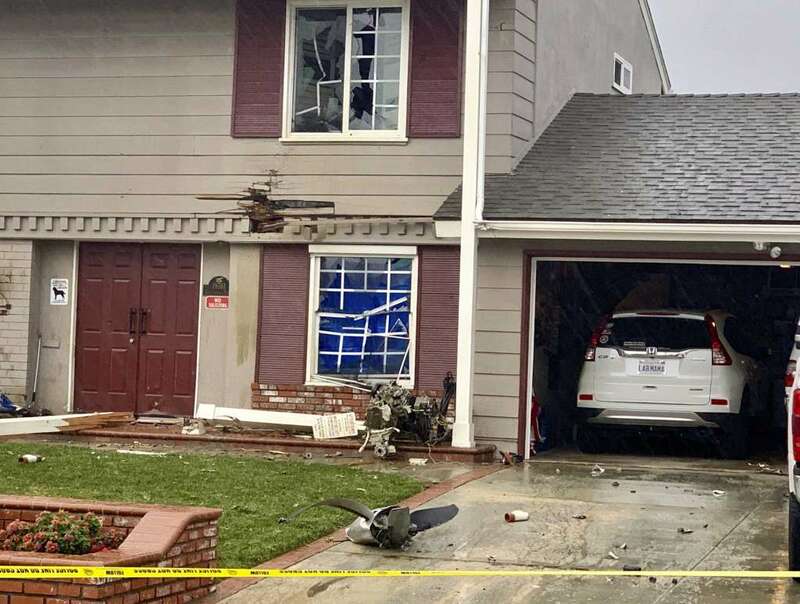 Here is a link to audio of the crash from a home security camera and it sounds like both engines are operating normally up until impact. https://www.youtube.com/watch?v=RSmttRBQ4x0 I'm leaning to a serious medical event causing the loss of control and the aircraft exceeding Vne and breaking up in-flight. I'm sure this can be easily ruled out through an autopsy. My second guess would be spatial disorientation in IMC causing a LOC because witnesses reported seeing the aircraft exiting the clouds in a steep dive before it broke up and caught fire. It seems unlikely with the pilot's experience being a CFI & advanced ground instructor that this was the case but it has happened before. I think there is more to this pilot's past than we may never know, kind of like the Las Vegas mass shooting suspect. RIP to all the victims involved and I will be waiting for the NTSB's final report. I am thinking medical incapacitation also. No IFR flight plan but plane seen exiting cloud. I'm thinking the incapacitation occurred during a trimmed up climb ... Plane continued climbing into the clouds before the upset occurred. RIP for all of those lost. Praying for a full recovery for those injured. Lots of bizarre dots to connect.....2 name changes with the FAA. Bizarre last minute FB posts.....2 licence suspensions.....Pilot for brothel owner that would fly the prostitutes in the plane if they paid for "Fuel", Fake paperwork and lies about being a former Chicago LEO with a stolen badge....The audio did indicate both engines operating.....not sure what VNE is for a 414, but it appears to have been exceeded by a large margin. What confounds me is how intact the fuselage remained. The aircraft appears to have only begun shedding parts during the explosion given the fairly small debris field. An uncontrolled decent from 7800 feet would have have reached VNE much sooner. Very bizarre and sad for those innocent that lost their lives. His 120 day license suspension was for flying IFR without a filing, so the previous poster has a good point. Anxiously awaiting autopsy results. I wonder what kind of "meds" will be found in the pilot's system? He was 75 yrs old so it could have been a sudden M.I. causing a loss of control. Vne for a 414A is 237 kts (273 mph) so I'm guessing the plane was topping 300 mph in that dive. From another video of the crash it appears the tail separated first then the right wing. I'm thinking when the wing separated just inboard of the engine nacelle, the fuel tank was breached causing avgas to spray out onto the engine which then ignited and that's the flaming debris and black smoke you see in the video. 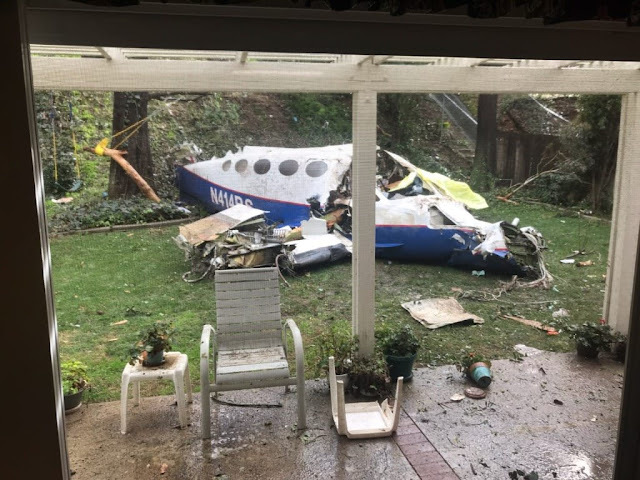 It is surprising that the fuselage remained largely intact after crashing through the house, loosing its other wing, exiting the back of the structure, crashing through trees and coming to rest in the backyard. There was a tree branch that pierced through the cockpit area so I wonder if the pilot's body was still intact? One other thing,a Cessna 414A holds 206 gal(approx.100 gal. per wing) of avgas so assuming he topped the tanks off prior to departing Fullerton municipal, he wouldn't have consumed much fuel in the short distance from departure to crash site. This would explain the intensity of the fire in the house with close to 100 gal of fuel raining down from the roof. One of the more horrific and well-documented crashes on this site which hopefully will aid the NTSB in finding the cause. RIP to all those that lost their lives that day. I do not think it was the cabin that impacted the house, it was the wing with the breached fuel tank feeding an active fire. Lots of questions on this crash, especially surrounding the registration in transit for one-year (N414RS), and the pilot's many violations, and fake Chicago Police credentials. The issues of a sudden health event, MEDS, or spatial disorientation are all good, but how about a suicide too? Seems with the facade being maintained, exposure was around the corner. Some kind of electrical system failure. Possibly smoke in the cockpit. This was typical all to often VFR INTO IMC and probably was not instrument rated. If you look at the video from the garage, it was raining and very low ceilings that day. If you listen to the audio you hear the plane climbing then he gets S. D. and comes straight down full throttle. I don't think the NTSB will have very much investigating with this excellent audio from at least 2 video cameras. If you look up Mr. Pastini's credentials on the FAA pilot database he had commercial, instrument,single & multi-engine land and rotorcraft-helicopter ratings. He also was a CFI & advanced ground instructor. Doubtful this was the cause but spatial disorientation can happen to anyone at anytime. I'm taking instruction to obtain my instrument rating and my CFI warned me not to reach down to pick up a pencil off the floor in IMC as this movement can produce vertigo and possibly lead to LOC. As for the full-throttle, I'm thinking of pilot incapacitation due to a medical issue. During instrument upset recovery training, the 1st thing they teach you do if in a dive is to bring the power back to idle so you don't exceed the Vne speed, level the wings and slowly pull it out of the dive. He never pulled the power back, possible suicide? I'm 100% sure this one will be spatial disorientation he got caught in IMC once spatial disorientation started he spiraled exiting the base of the clouds at max speed. He sees the ground coming at him he pulls hard on the controls over stressing the air frame causing wing to break off. The audio recording you can hear the engines RPM rising rapidly in a steep angle dive. There was a reason he had no IFR plan maybe he wasn't current who knows. Wings break off from pulling hard on the controls while exceeding VNE. The heart attack theory that's possible but I don't think the wings would have broken off. He could have awaken when he saw the ground rising pulled hard then. I really think this will just be case of spatial disorientation. I wish there was a way to pull up what the weather conditions at the departure airport and surrounding area was at the time of departure. I would be interested in what the ceiling and visibility were. The dashcam videos I've seen on Youtube of the accident dive looks to me like a higher ceiling. If so, you would think he should of had enough altitude to regain control once he exited the clouds. I think the audio recording of the engines NOT throttling back is significant. I think the medical issue theory will be validated or ruled out once the autopsy results are in. I'm sure the legal team of layers are already hard at work on this one. There was a Nest Cam video with sound showing the explosion and the large pieces of the plane falling to the ground but it has been removed. Interesting that info about this crash and the pilot are starting to disappear from the internet. I just tried to access Mr. Pastini's pilot credentials from the FAA pilot database and it shows NO RECORDS FOUND! I was able to print a copy of his credentials back on 2-5-19 but it's as if he never existed now. Makes you wonder if there is more to this story that they don't want the public to know. If we had "real journalism" in this country someone would break this story but I'm afraid that they're too intent on digging up dirt on Trump that's not there (fake news). Wow that audio is amazing, I've heard a lot of twin Cessnas in my days but nothing like that, I would guess spatial disorientation on that very rainy Super Bowl Day, panic, a hard pull up over VNE speed after exiting the bottom of the clouds tail separates causing a very heavy negative G load on both wings, from the vid that was earlier posted you can see the fuel spray (not smoke) ignite after wing breaks apart. At that point the pilot was a passenger on scrap metal falling down....... a bad series of events. No flight is so important that you have to push or exceed the limits legal or illegal, a fully capable plane for IFR into known icing also doesn't make you a good pilot. Stay on the ground watch the Superbowl with some beers and don't ruin someone else's day. I think I read the base was 1500 AGL that day not enough to pull it back to level at 300 mph plus. Really not much he could have done at that point maybe he tried. Even if he through the gear, flaps still not going to slow enough to pull it out. Maybe in an extra 300 he could have done it. I wonder if he had a vacuum pump failure leading to LOC in IMC? Someone mentioned that possibly he had a PFD display failure glitch due to ADS-B but the one pic shown of Mr. Pastini in the pilot seat of the accident plane doesn't look to be equipped with one. I don't know if this plane had a backup vacuum system or an electronic attitude indicator. I do agree with the previous posts that in order to pull the wings & tail of the aircraft, the pilot must have made some strong control inputs. I guess under the right conditions, spatial disorientation can happen to the best of us. Witness protection program? That might explain his ambiguity but not his bad piloting skills. I was guessing he was WITSEC as well, Chicago Mob. I feel for his family if they did not have a clue and are unraveling their Dads affairs. My heart goes out to the Anderson family as well. No one expects a plane to fall out of the sky. One of the news videos shows a dashcam footage where the plane explodes in the air and broke apart. He was probably killed before the plane crashed. The audio of the aircraft flying before the crash was chilling, seems like a VFR in IMC event. RIP. To the previous poster, it's the old "chicken or the egg" argument. To the non-pilot it appears that the plane exploded then broke up in-flight. But we pilot's know that the plane exceeded the structural design speed and/or G loads of the airframe, broke up causing a breach of the wing fuel tanks. The fuel became atomized which then ignited possibly due to the hot engine or a spark from torn electrical wiring, the flaming debris fell to the ground hitting the house with the fuselage coming to rest in the backyard of the house down the hill. I'm betting that if the pilot didn't have a massive heart attack that started the whole chain of events, he most likely survived until impact with those trees in the backyard. The autopsy should clear up a lot of unanswered questions if it's ever released. The NTSB will find the cause/causes of this tragic event, until then all we can do is speculate. This could be a contributing factor but I don't think it will be the main cause due to the way the aircraft broke up in flight, which I believe was pilot induced. In one of the video's it is clear that the 414 was intact and not on fire when first breaking through the cloud base, it did come apart and catch on fire before impacting the ground. 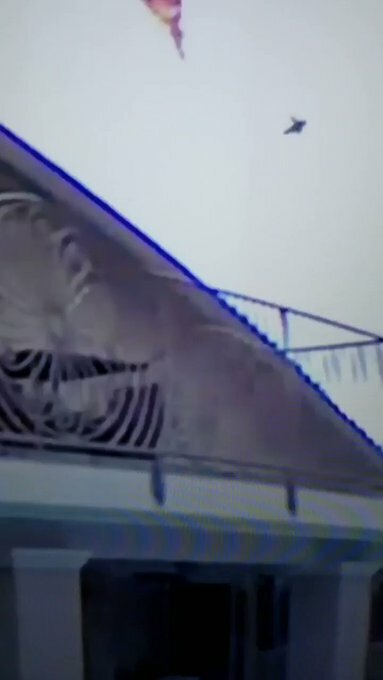 In one of the videos/audio recordings (from a home security camera) there were no abnormal sounds coming from the engines until the pilot got into trouble. If the pilot was conscious and experiencing disorientation, he probably pulled up hard on the elevator control after breaking through the cloud base when he saw the ground, while in a dive (past VNE), and over-stressed the aircraft. The typical scenario in this event is for the horizontal stabilizers (and some times along with the vertical stabilizer) to fail first, then the wings. The fuel was probably ignited by severed electrical wires shorting and sparking. "The Federal Aviation Administration suspended the license of Antonio Pastini in 1977 and 1980, according to The Times, which cited records kept by the Library of Congress." "The first suspension – for 120 days – came after he flew in cloudy, icy conditions from Las Vegas to Long Beach and lied about his credentials. The second was because his plane was not up-to date on inspections, had an expired temporary registration and was leaking brake fluid, according to The Times. The second suspension was for 30 days." Even experienced, and high time pilots are not immune to mistakes. I had a customer/friend pilot who was instrument rated (but not current) crash his 210 while in IMC on final approach to Salt Lake City, killing all six on board. Airplane came apart in the air due to pilot induced over-stresses. Another customer (a retired airline captain with close to 30,000 hrs of flight time) crashed his 310 on departure due engine failure caused by fuel starvation because the fuel selectors were in the wrong position. It will be very interesting to read the final NTSB report in a year or two. Condolences to all impacted by this tragic event. "Another customer (a retired airline captain with close to 30,000 hrs of flight time) crashed his 310 on departure due engine failure caused by fuel starvation because the fuel selectors were in the wrong position." I would like to read the report on the 310 departure crash. Would you please share the tail number or the date and location of the accident. I have looked everywhere for the 310 crash report without any luck. Can't remember the date, but it was in the mid 1980's. The aircraft was based at Chino airport, and that is also where the accident happened. The pilots name was Oscar I think he flew for Pan Am, he was severely injured (broken back) but survived, the 310 was a total loss. The impact site was just north of the dyno shop (next to hanger 1) in the oleander bushes, south of the old VFW location, and only about 100yards west of the fire station. It's been over 30 years since I worked at Chino Airport, my memory may be a little vague, lol. In the words of a great American . . . "Trust, but verify." Just found on the internet that Mr. Pastini also owns a nice 1963 Beechcraft Debonair N8525M registered in Chiloquin,OR. FlightAware shows that he was very active flying that plane as well as the Cessna 414A. Looks like he got the Beech back in 2015. I think there's much more to Mr. Pastini or whoever he is that we may never know, but I'm thinking witness protection program or some covert ops for starters. I live in Los Angeles about 10 miles from where this crash happened and remember hearing about it. The weather was very bad as we were getting a winter storm and it doesn't rain often here. We typically get 14 inches of rain for the year and this year we're already at 18 inches so its been a very stormy/wet winter for us. It was a low ceiling with rain sometimes heavy and a big state wide cold front. Do we know if he was IFR rated yet? Basically, did he have any business being up in the air in that weather? I get that he falsely claimed to have IFR clearance but was he IFR certified? As a pilot, I sometimes get lazy about filing flight plans especially if its a quick hop or something but very careful to not intentionally fly in IFR when I'm only VFR rated. Yes, he was. Read some of the previous posts as Mr. Pastini had Commercial, Instrument, Rotorcraft, CFI, Ground Instructor but his info has been scrubbed from the FAA website. Weird? Sounds very much like someone who doesn't exist. Mystery solved. It was Jimmy Hoffa in a government diversion program. Regardless of the dubious conspiracy theories which don't hold the test against Occam's razor, it is a reminder for us pilots innocent lives are at stake when we take on flying and hence why it is a supreme privilege to be granted the right to maneuver a multi tons machine at incredible speeds high in the air. A few more irresponsible idiots like this dude and soon flying will be off limits to those not commercial or militaries. It is 100% a certainty it was pilot error... well 98% certainty as statistically only 2% of accidents are attributable to some kind of mechanical issue, so we are left with yet another case of highly publicized case of needless deaths on the ground that give GA a black eye in the general public. Let's honor those who died needlessly and try to educate this public flying is as safe as can be with human factors the only element that causes deaths and that other forms of transportation are much more dangerous per mile or hour or per capita. By orders of magnitude. Re. the above comment: ". . .give GA a black eye in the general public." I'm a member of the general public, have only flown commercially (limited times), and, yes, GA definitely has a "black eye" with me. Surely my judgment is skewed from reading this blog. As good as it is, maybe I "read too much!?" Maybe it's really not as bad as I think. But to think that you could be watching TV or making dinner in your kitchen and one of these darn, small, noisy, buzzing things crashes into your house or neighborhood, it just makes the non-aviator type person wonder what was so worth it (flying)!? As I say, I'm just a regular person, and I'll stick to the 747-type of planes if I need to get someplace without a decent expressway. (Thinking of New Zealand....) I know, even big planes crash, but apparently not with the regularity of the small stuff. Boy, I'm on a roll tonight. Sorry to keep going on and on about this. Was just thinking, though, why I prefer larger planes if I have to fly (ref. my last paragraph above). It's due to the safety-net that commercial planes have...…….the team of people on the ground doing maintenance and hopefully having lots of required documentation either to instruct them in doing it or causing them to prove that it was completed, the safety net that you have a pilot who's primary job is to fly planes for X number of years (should be quite good at it by now), and the safety net knowing there is more than one pilot flying said commercial plane in case one pilot is disabled. Alright, my opinion isn't important, but it kinda feels good to vent a little; also to force myself to back up my loose statements with some small bits of logic! ..smiling..
To Cece above ...... for someone that doesn't "get" or like GA, you sure spend a lot of time reading and posting on an aviation blog. @cece no one asked for your misinformed and unsolicited opinion about GA. You must know that you're being a troll in a blog that is frequented by pilots. Congratulations, you succeeded in offending an aviator on an aviation site. On other note, new facts are coming about about the pilot receiving an adverse weather advisory before departing VFR. It's looking like a typical VFR into IMC made worse by a selfish PIC who had a history of warning signs. What I don't understand is why in the world IFR rating is not a requirement for obtaining a license. If you are flying in the sky clouds are pretty much a given. Why does certification not mandate that level of training before they let anyone get up in the air ? Cece, you are a troll indeed. An uninformed know it all exemplifying Dunning-Krueger. Kinda the same idiots that loathe at motorcycles splitting lanes as they are stuck in traffic, as they would love to have those motorcyclists add to the traffic driving SUVs instead of being on fast agile and effective motorcycles. Aviation is not that expensive considering driving kills millions of people each year worldwide in car crashes and costs $2 per mile if one factors the later costs of deaths and injuries on top of the cost of freeways and roads to be build which is generally in the millions per mile. One insurance company estimates that considering all the externalities of pollution, reduced productivity and congestion etc... driving a car is $5 per mile!!! In comparison flying a plane seldom costs more than 50 cents per mile on average if one flies in a 50k C172 and with 3 passengers the economy reaches 30-40 mpg, not to mention flying is 3-5 times faster than driving and on par with commercial flying where the overhead of security lines and delays makes the experience akin to a sardine can. CEOs and physicians routinely use small aircrafts that can let them visit several far flung sites every day. It is not a mode of transportation for the plebes indeed but for the 1% that have the skills and the need. And since we don't live in communism, your opinion on the matter is unimportant. The latest reports and info appear to confirm spacial disorientation. I had earlier claimed I found it odd the aircraft did not come apart at some earlier time in the 7800 foot spin. It now seems that when he broke thru the overcast, he attempted to recover and over-stressed the airframe which only then began to shed parts and burn. "Let's honor those who died needlessly and try to educate this public flying is as safe as can be with human factors the only element that causes deaths and that other forms of transportation are much more dangerous per mile or hour or per capita. By orders of magnitude." This is debatable. You are including commercial aviation which is heavily regulated and very safe but its debatable if GA is safer than driving per capita. How dangerous is flying? There are 16 fatal accidents per million hours of general aviation. It is fairly safe to assume that when a plane crashes and someone dies, everyone on board dies. By contrast, the death rate for automobile driving is roughly 1.7 deaths per 100 million vehicle-miles. Car crashes don't always kill everyone in the car so let's use this statistic as provided, which is for an individual traveling in a car rather than for the entire car. So considering that the average airplane accomplishes a groundspeed of at least 100 miles per hour, those million hours of flight push the occupants of the plane over more than 100 million miles of terrain. Comparing 16 fatal accidents to the 1.7 rate for driving, we find that flying is no more than 10 times as dangerous per mile of travel. And since most accidents happen on takeoff or landing, a modern fast light airplane traveling a longish distance might be comparable in safety to a car. We can also look at safety per hour. This makes sense for recreational pilots who have the alternative of spending a few hours flying around or spending those hours taking a scenic drive. If the average speed of car travel is 50 miles per hour, those 1.7 deaths occur in 2 million hours of driving. This makes general aviation, with 16 deaths per 1 million hours, roughly 20 times as dangerous per hour than driving. Regarding: "What I don't understand is why in the world IFR rating is not a requirement for obtaining a license. If you are flying in the sky clouds are pretty much a given. Why does certification not mandate that level of training before they let anyone get up in the air?" When getting a private pilot's license, you are required to get a few hours of IFR training but that is spacial recovery training (like you inadvertently went into a cloud) rather than a whole set of new regulations for flying blind. Most pilots are purely recreational and never get near a cloud so the training isn't mandatory but regardless wouldn't have mattered here since this PIC was IFR certified. @0:09, I thought that was the moment of impact when you hear the boom and the high pitched engines are silenced but we see the reflected explosion a second after and the crash itself is at 0:16. Looks like the case against Pastini has gone cold. Simple case of "spatial disorientation" in IMC ,exceeding Vmc and shedding airframe parts in the pull-up?